Daikon radishes may not seem like something worth celebrating however, when you harvest heavy crate after of heavy create of this hearty winter radish (despite your back killing you) you have to make up for the hard labor somehow. Thankfully, this recipe is just what the doctor ordered and also happens to be the recipe of the week for our CSA members. I created this recipe partially out of frustration from the morning’s harvest but mainly because I wanted our CSA members to have a tasty way to incorporate daikon radishes into a main meal. This recipe is simple, delicious and uses a ton of vegetables that were included in our member’s shares this week. Oh yeah, if you aren’t familiar with daikon radishes they look a little something like this. They’re slightly spicy, crunchy and make the best veggie “noodles” when julienned with a vegetable peeler. They’re a great addition to this pasta and I hope you all enjoy this recipe as much as we do. It tastes best eaten with good company and a pint of your favorite house beer. Cheers from Tumbleweed. Heat the oil in a large skillet over medium heat. Add the scallions and cook until fragrant, about 2 minutes. Stir in the chickpeas and continue to cook, stirring often, until the chickpeas are lightly browned. Add the bok choy ribs and cook for about 3 minutes longer. Add the bok choy greens and cook until the greens are tender and slightly wilted. Remove from heat. Cook the soba noodles according to specific brands instructions. Prepare the ginger miso sauce by combining all the ingredients and whisking until smooth and creamy. This works well with an immersion blender. Taste test and adjust seasonings if need be. Add additional water if the sauce is too thick. Drain the soba noodles and add them to the vegetable mixture. Stir in the julienned daikon and carrots and toss well. 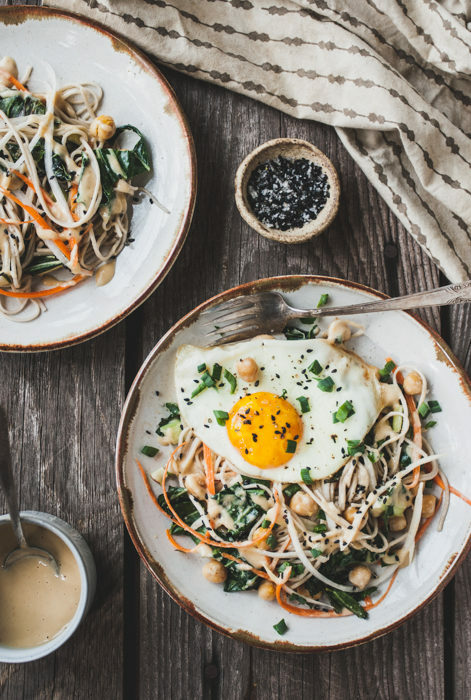 Drizzle the noodles with the ginger miso sauce and continue to toss until well combined. Divide noodles between bowls and top with fried eggs, toasted sesame seeds and minced scallion greens. Season with salt and pepper if necessary. Serve warm, at room temperature or cold. that picture of you with those radishes is totally outstanding!!!!! !